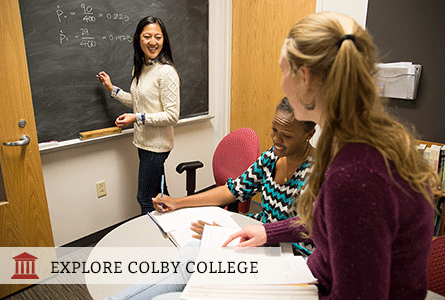 Colby offers a rigorous academic program connected to the world's challenges, including 58 majors and 35 minors. The student-to-faculty ratio is 10:1 and more than two-thirds of courses have fewer than 20 students. The College's DavisConnects program guarantees access to a global research of internship experience for all students, regardless of their ability to pay. Individual advisors offer career, graduate school, and pre-professional guidance beginning in the first year. Students engage the 4-1-4 academic calendar often taking four classes in the fall, one class in January as part of the first-of-its-kind Jan Plan term, and four classes in the spring. Jan Plan provides students with extensive coursework, research, and internship opportunities on campus and around the world. Numerous research opportunities with world-class faculty scholars generate strong student-faculty mentorships and often result in coauthoring peer-reviewed articles or presenting research to large audiences. Nearly 70% of students study abroad, choosing from 100 programs in more than 60 countries. Students interested in engineering can participate in dual-degree engineering programs with Dartmouth or Columbia, and earn 2 degrees - a B.A. from Colby and a B.E. or B.S. degree from the partner institution. Colby's Buck Environment and Climate Change Lab grants students access to extraordinary research experiences and internships focused on climate changes and sustainability. Colby is one of only a handful of small liberal arts colleges to combine Computer Science, Biology, and Genomics with world-class research opportunities in Computational Biology, as well as the chance to combine computer science with another discipline through the Interdisciplinary Computation Program. One of the finest college art museums in the country, the Colby Museum of Art, as well as the Lunder Institute for American Art, offer countless opportunities for students to engage with many of the very best artists and pieces in the world.